The tool has been developed to be used to the developer, the Kongsberg MBR advantage. Timproving ef? ciencies in aquatic habitat mapping. 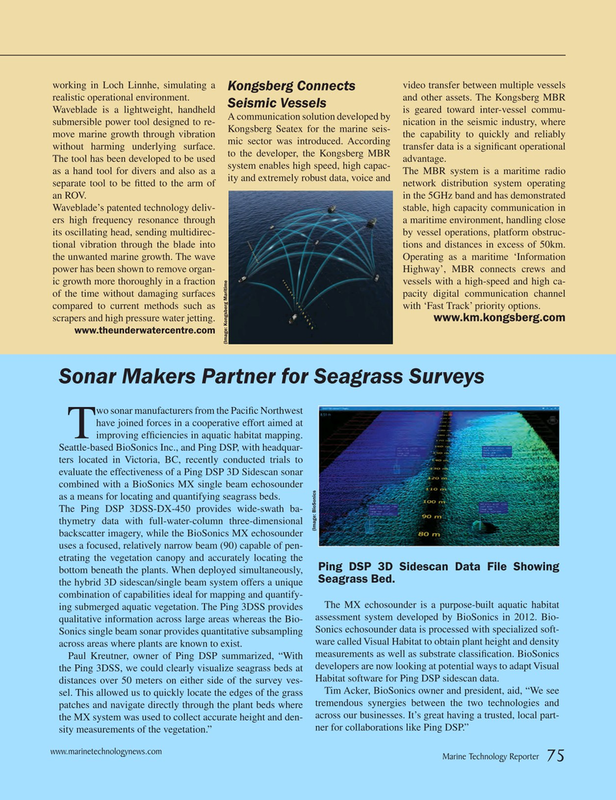 Seattle-based BioSonics Inc., and Ping DSP, with headquar- ters located in Victoria, BC, recently conducted trials to evaluate the effectiveness of a Ping DSP 3D Sidescan sonar combined with a BioSonics MX single beam echosounder as a means for locating and quantifying seagrass beds. Sonics single beam sonar provides quantitative subsampling Sonics echosounder data is processed with specialized soft- ware called Visual Habitat to obtain plant height and density across areas where plants are known to exist. Habitat software for Ping DSP sidescan data.